Nobody has opened more gates in competition with greater success than Cynthia Cantleberry. 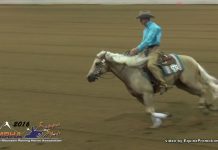 This Paso Robles, California, trainer has amassed an unprecedented 14 AQHA World Championship trail titles in her career, which makes her the winningest trail competitor in the 24-year history of the show. In 1994, she became the first person ever to win World Championships in both the senior and junior horse divisions in the same year, on the 17-year-old mare El Seven Becky and the 4-year-old filly Larks Lumbata. With countless Class-A and regional wins, Cantleberry is the undisputed authority when it comes to training winning trail horses. While the mechanics of opening a gate, riding through and closing it again are basic, it is Cantleberry’s personal style that has helped set her apart in competition. It is a style based on her no-nonsense philosophy of what a trail class should represent. Before attempting to teach a horse to negotiate a gate, there are some basic skills that must be mastered by both horse and rider. First, the horse should be able to stand quietly on a loose rein, without fidgeting or moving, while the rider reaches down or over to grasp the gate. 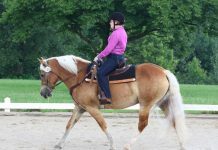 The horse should also be able to back up in a straight line with only light pressure on the reins. He should also be able to sidepass in both directions, turn on the forehand and turn on the haunches. The rider should be able to open a gate without inadvertently moving his or her legs against the horse’s sides and without causing weight to shift so that the seat bones dig into the horse on one side. Doing either of these will send conflicting signals to the horse, and confuse and possibly irritate him. Not only will the rider be incapable of performing a smoothly executed gate, but if the horse swishes his tail in irritation, it could catch on the gate or gate decoration, and scare or hurt the horse. This understandably would not enhance the horse’s trust in gates or his performance. Riders should practice these skills with a trainer in the arena and on the trail until they are second nature. Once the power steering is perfected, it’s time to put it all together at the gate. Cantleberry has several different gates in and around her arena at home to practice with, so that her horses feel comfortable with a wide variety and aren’t intimidated by ones they’ve never seen. Rope gates, which are cheaper to build and easy to transport, are becoming increasingly common at shows. Because they are easier to open and close, they also help to speed large classes along. A class of 120 entries — not unusual at larger shows — can be shortened by as much as two hours if management installs a rope gate instead of a traditional one. The Approach: The obstacle preceding the gate in the course will determine the direction and speed of a competitor’s approach to the gate. The judge will begin scoring this move as soon as the rider focuses on the gate, so the approach must be smooth and efficient, without a lot of maneuvering for position. The horse should walk up and stand parallel to the gate with no hesitation, and the rider’s right or left shoulder (depending on whether it is a right- or left-handed gate) should be directly above the latch. Correct equitation would dictate that this also means the rider’s hip and lower leg will be immediately adjacent to the latch. This way the rider doesn’t have to stretch forward or back to work the latch, as it is right there within easy reach. Cantleberry says her goal is to remain as close as possible to the gate at all times without actually hitting it. Riding Forward Through, Push: To open the gate this way, Cantleberry positions her horse’s head so it’s facing the latch, and his haunches are close to the gate’s hinges. After flipping the gate’s latch, Cantleberry backs up just far enough for her horse’s head to clear the upright post. Since the idea is to keep the gate blocked against escaping cattle, she won’t push it all the way open yet. Instead, she opens it just wide enough to guide the horse’s head through. “Some people open the gate real wide at this point, but it’s easy to lose control that way,” she says. Keeping the opening small helps decrease the margin for error, but it also requires more skill to ride through a tight opening without bumping the gate or touching it with anything but a hand. Cantleberry advises riding forward only halfway through the opening, pushing the gate just wide enough to let the horse pass through it. At this point, the gate is just behind her leg, and her hand on the latch is slightly behind her hip. She then asks the horse to stop and begin to execute a turn on the haunches to open the gate the rest of the way while still blocking the opening. Riding Forward Through, Pull: To pull the gate open rather than push it, Cantleberry starts from the same position with her leg slightly behind the latch, then she reaches down and unhooks the gate. Sidepassing away from it just enough — a step or two — creates an opening wide enough to ride through without hitting the horse’s hips on the posts. A turn on the forehand pivots the horse around her gate hand until his head is pointing through the opening. “I ride through just far enough for his hind end to clear,” she says. As she does this, she slides her hand along the top rail so she doesn’t get off balance. Back Through and Push Open: Backing through a gate calls for a different approach. The horse will be facing the hinged end of the gate rather than the latch end. 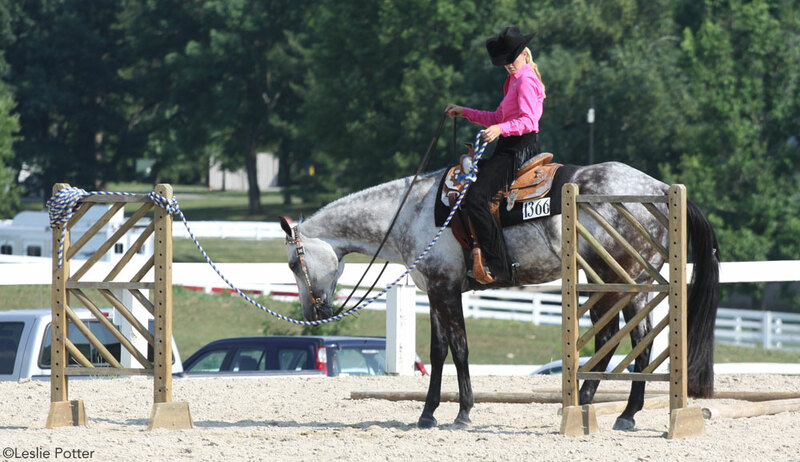 Although the horse still needs to be parallel to the gate, the latch should be directly in front of the rider’s knee, not slightly behind it. This puts the horse in a better position to maneuver while the rider still maintains maximum control of the gate. After lifting the latch, Cantleberry rides forward a few steps until her horse’s hind end is just past the gatepost. Asking her horse to turn on the forehand, she slowly pushes the gate open as the horse steps toward it with his haunches. When the opening is wide enough, she asks him to back straight through without bumping the gate with a hip or a stirrup. This requires the rider to look over his or her shoulder while backing, and is where some riders get into trouble. “I’m careful not to shift my balance in the saddle as I turn my upper body or it would inadvertently cause my horse to back up crooked,” says Cantleberry. Once her hand is on the latch again, she asks her horse for a 180-degree turn on the haunches. This pivots his front end through the opening, putting her in position to ask for a short sidepass toward the gate to close it. Back Through and Pull Open: The last alternative is to pull the gate open and back the horse through it. When her horse is parallel to the gate with his head toward the hinges, Cantleberry lifts the latch and asks him to step back and away from the gate, pulling it open in the process. “I keep my horse’s hip into the gate, which blocks the opening and keeps his head out of the greenery,” she explains. Once the opening is wide enough, a turn on the forehand maneuvers the haunches through the gate. When the turn on the forehand is complete, her horse is through the gate, and Cantleberry is in the optimum position to close the gate behind her, with the latch directly below her knee. Flowers and shrubs may make a colorful obstacle, but they can also increase its difficulty level. Knocking over a potted plant or, worse yet, reaching out and snatching a mouthful, will be counted against a horse’s performance. Depending on the configuration of the gate and the location of the next obstacle, this could mean simply riding straight ahead or sidepassing a few feet away from the gate before turning toward the rest of the trail course. An important note: If the gate has feet or support braces, be careful that your horse doesn’t step on them. Not only will it cost you lost points, but it can injure him as well. And above all, don’t rush. It is far better to take 30 extra seconds and appear focused and methodical, than it is to try to save time and risk a careless mistake. Breaking up the challenge of the gate into distinct, separate steps — approach, unlatch, ride through, close and depart — will require the rider to pay attention to important details that can make a significant difference. Doing this will not only result in higher scores from the judges at shows, but can have “real life” practical effects as well: Guarding the gate when going though just may prevent you from an embarrassing mistake that could cost a day’s work rounding up lost cattle! Your trail articles are very good reading, however, a picture is worth a thousand words. I wish there were some images with the “training” type articles. Yeah!! Thank you, thank you, thank you for such wonderful, step by step instructions on gate opening! This has been a challenge for me with different horses over the years and this article is so easy to understand that I’ll be able to practice this on any horse. I’m printing it out immediately for reference! Thanks, again. Where would a person buy these gates from and also if you would know where a person could purchase clips for jumps. I agree that these article as very helpful, some need to be reread to make sure that i understand it all. we better get practicing as soon as it gets warmer. This article is totally clear and very informative. Thank you so much.